Have you ever done a money challenge? Money challenges are always very popular at the start of a new year. They are a great way to save and exercise some discipline as well. When I first heard of these money challenges some years back, I thought “What an interesting way to save!” It’s almost like a little game with a nice reward at the end. You can attach goals to these challenges which always makes it more interesting. Money challenges are great tools to help you with having a positive money mindset. They also allow you to have and celebrate small wins, especially for those with a small income or very limited budgets. The beauty of it all I they are quite simple and there’s so much flexibility. For example, you don’t have to start with week 1. You can go in any order you choose! There are several that start with $1! One dollar! That makes you feel like “Yaaassss, I can do this!” With any challenge, the motivation must come from within! I’ve participating in a few of these challenges and some I never completed because it simply didn’t fit with my normal lifestyle. For example, the $5 challenge requires you to have cash and I very seldom carry a lot of cash, so I never had $5 bills. In my first 3 months of the challenge, I had saved less than $50 because I never had bills. I scrapped that challenge because it wasn’t worth it to me. On the other hand, in 2016, I did the $5,000 challenge and it worked really well for me. I would set the deposit amounts to automatically transfer and never had to worry about it. I also decided in the beginning of the challenge that the money saved would be my deposits for my Roth IRA as I needed a tangible goal to attach to the savings. Here's a few things I learned from my money challenges… Please note these are personal things I learned about myself and they may not apply to you and your lifestyle. 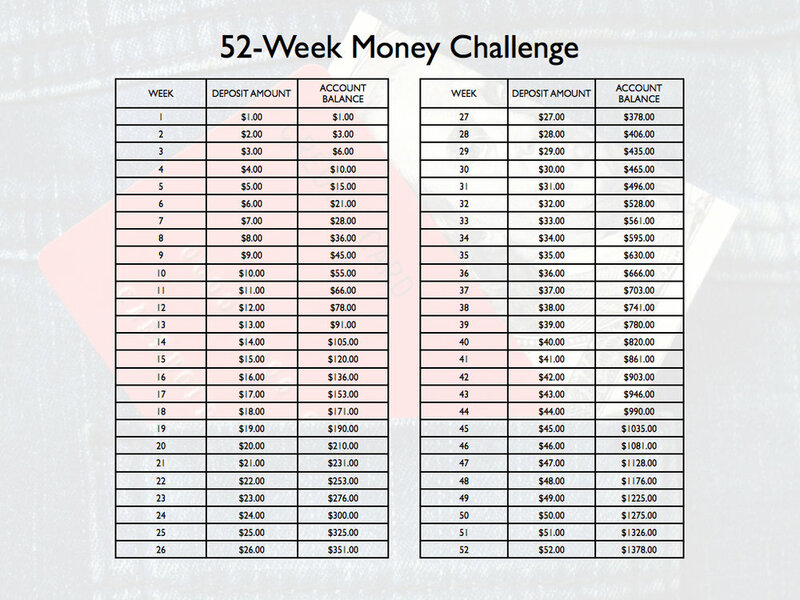 Let’s talk automation… If you are using one of the many savings apps, such as Qapital, they have a “52-week money challenge” preset, and you can just set it and forget it! If you would like to learn more about Qapital and sign-up for a free account, click HERE. Here are a few of the most common challenges. It’s simple, you start with $1 in the first week of the year and as the weeks progress, your deposits increase every week by one dollar. So, in Week 2, save $2 and in Week 3, save $3 and so on. At the end of the year, you will be saving roughly $50/week. At the end of the year/challenge, you will have saved $1,378. This challenge is done on a monthly basis where you take the #of days in the month times the month and that is your deposit for the month. For example, February is the 2nd month of the year and there are 28 days in the month. Your deposit amount for February will be $56 (2x28). For August, your deposit amount would be $248 or 8x31. At the end of this challenge, you will have saved $2,382. This challenge is a weekly challenge which saves between $125 and $325 per week. This is a great way to save for a large goal such as a deposit on a home or a cash car! This challenge saves $5,000 in just a year! I completed this challenge back in 2016 and funded my Roth IRA. The deposits range from $20 to $200. Psst… let me tell you a secret! You don’t have to go in order. If you don’t have $170 in Week 32, then save $65 from Week 37 and do Week 32 later when you have more money! For this challenge, every time you have a $5 bill, you save it. No spending of five dollar bills! One of my good friends saved over $900 in 2018 doing the $5 challenge. There are so cool savings boxes you can purchase or DIY with a shoe box! For this challenge, you choose a number of envelopes you would like to fill over the year. 100 envelopes seems to be the most common. Then you write the numbers 1-100 on the envelopes. You then randomly select envelopes throughout the year and fill them with cash. Your deposit amount is the number envelope you select. There are so many challenges out there so which one is right for you. I’m just excited that you’re saving! Happy Saving and Happy New Years! Please note this post may contain affiliate links. If you buy something through one of those links, you won’t pay a penny more but we will receive a small commission. Thank you!